The Pegasus Independent Villa luxuiously boasts Queen size beds, contemporary living areas, a balcony with heated outdoor Jacuzzi and a beautiful terrace with sun loungers to the uttermost satisfaction and privacy of the guests. The Stars Plunge Pool Villa boasts all the necessary amenities and a heated plunge pool with Jacuzzi, offering breathtaking views of the Aegan Sea. The Pegasus Suites & Spa ensures guests a calming holiday full of memories, enjoying the serenity and allure of one the world’s most romantic destinations. Perched over stunning cliffs and staggering architecture, the hotel is tucked into the surrounding landscapes, preserving the original structure of the wildlife, volcanic rocks, and subtle colors of the Aegean without giving away the modernity it brings to its environment. Studios and suites have been built and designed according to the authentic Cycaladic architecture, offering guests relaxation, a lovely mood, a romantic ambience and stay they will never forget. The property boasts a restaurant with delectable international cuisine, served along with fine drinks. 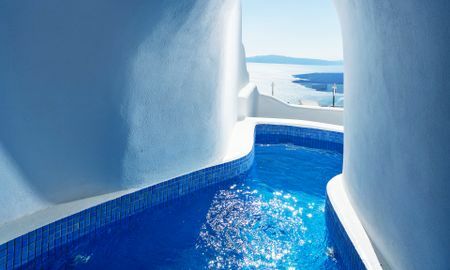 The hotel provides an extensive array of exclusive services and facilities such as a glistening pool overlooking the Caldera, where leisure days will gladly be spent. The Pegasus Suites & Spa places the guests’ wellness first and foremost on their list of top priorities, ensuring relaxation to the utmost with an indoor heated pool and a variety of treatments to calm body, mind and soul. Besides, a fully kitted fitness centre is available for the guests not to miss their workout regimen. Visit the remains of the Skaros Venetian castle, discover the church of Theoskepasti, and enjoy amazing views of the volcano. 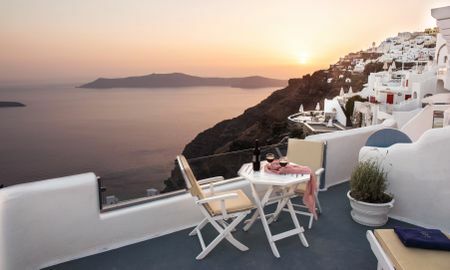 Besides, walking around Santorini will leave the guests speechless, as it is famous for glorious sunsets and breathtaking views of the Aegean Sea. 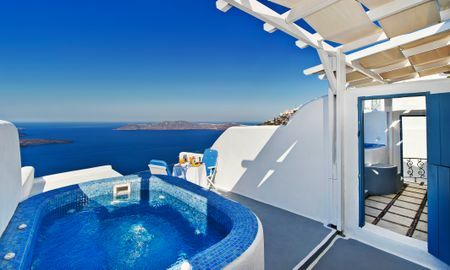 Pegasus Suites & SPA - Adults Only boasts phenomenal suites situated not far from Fira. 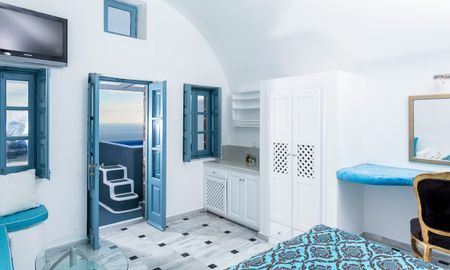 Perched snuggly on the cliff of Imerovigli with views above the Caldera and volcano, the village of Imerovigli is one of the most stunning locations Santorini has to offer. 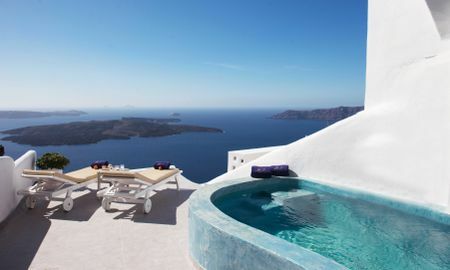 Its fabulous location exudes a calming vibe, contrasting with the vibrant atmosphere of Fira. 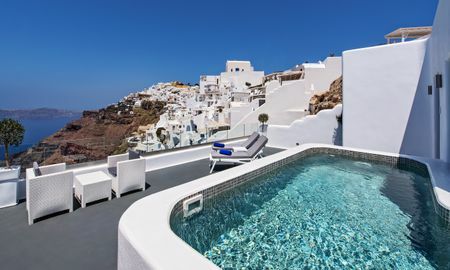 Busses connect with villages on all areas of the island, but Fira is within easy walking distance to the caldera and as such guests can enjoy stunning views of the surrounding landscape. Just 1,5 km from the island’s capitol Fira town, boat transportation is easily accessible, with the Athinios port being only 9 km away. 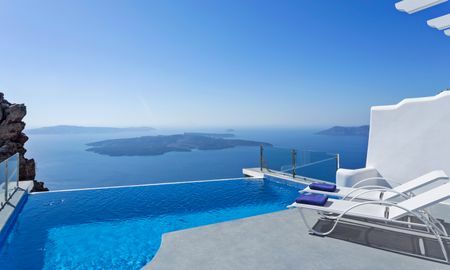 And with Santorini Airport only 7 km from the hotel, it’s no wonder that guests will enjoy the convenient, beauty and serenity Pegasus has to offer.